Mariner's Rest01263 715779work01603 870304fax Self-cateringSpacious and with a lovely garden, this comfortable bungalow in the coastal village of Overstrand, near Cromer is a great spot for a relaxing holiday, Mariners Rest offers plenty of living accommodation, including a conservatory, two bedrooms a bathroom and a shower room. This Victorian village, once the holiday retreat of Winston Churchill, has an elegant feel to it and is only moments away from the popular seaside resort of Cromer. Famous for its Pier with year round shows, restaurants, cafes, cinema, zoo, golf and other attractions, this stretch of the coast is a delightful area to enjoy at any time of the year. 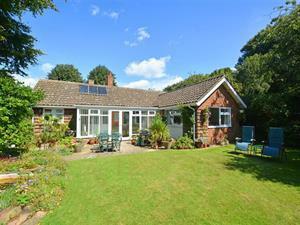 Spacious and with a lovely garden, this comfortable bungalow in the coastal village of Overstrand, near Cromer is a great spot for a relaxing holiday, Mariners Rest offers plenty of living accommodation, including a conservatory, two bedrooms a bathroom and a shower room. This Victorian village, once the holiday retreat of Winston Churchill, has an elegant feel to it and is only moments away from the popular seaside resort of Cromer. Famous for its Pier with year round shows, restaurants, cafes, cinema, zoo, golf and other attractions, this stretch of the coast is a delightful area to enjoy at any time of the year.